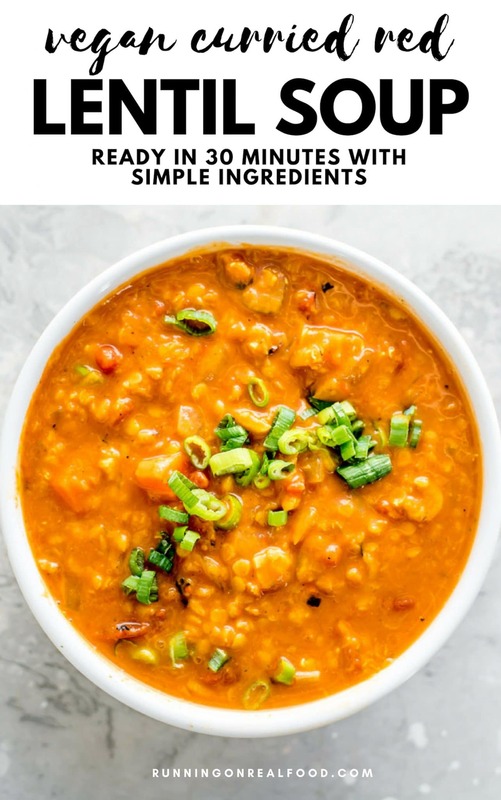 This quick and easy curried lentil soup takes less than 30 minutes to make, is perfect for food prep and is packed with flavour and nutrition. This recipe is vegan, gluten-free and oil-free. You guys probably know by now that lentils are one of my favourite foods. 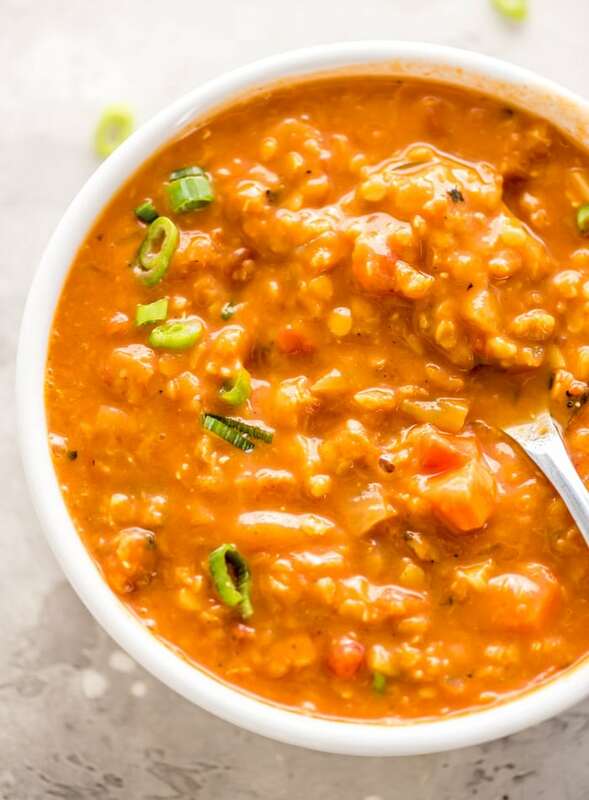 Lentils are nutritious and versatile, especially if you eat a plant-based diet. You can read more about the many health benefits of lentils here. 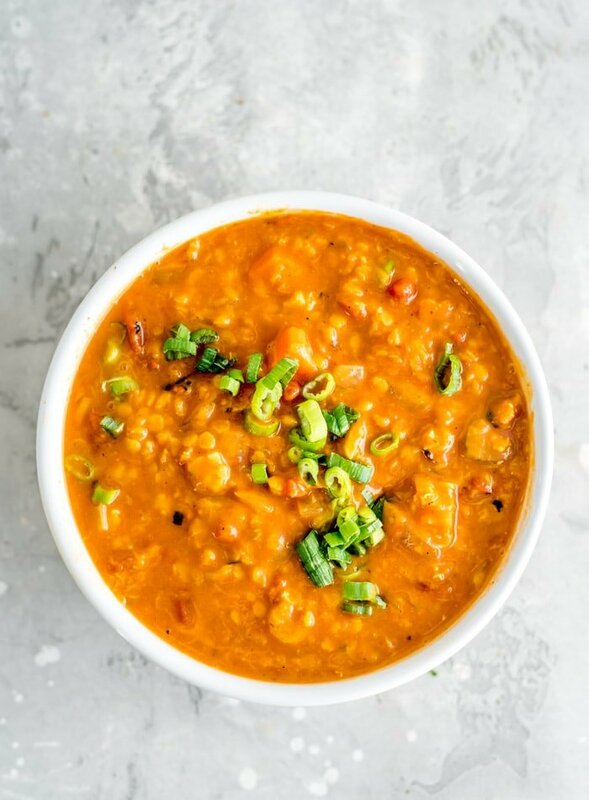 This delicious curried soup is very easy to make. You can have it on the table in about 30 minutes from start to finish. Red lentils. Red lentils are best for this recipe as their texture as they cook works well in soups. They become very soft and creamy whereas green and back lentils are firmer and hold their shape. Spices. I used yellow curry powder, cumin, coriander, salt and pepper in this recipe. If you don’t have curry powder, I’d suggest making your own using this recipe for DIY curry powder. It calls for coriander, cumin, turmeric, ginger, mustard, pepper, cinnamon, cardamom and cayenne and yields 1/3 cup. Canned diced tomatoes. I love these organic fire-roasted tomatoes from Muir Glen. You’ll need 1 28 oz can or two 14 ounce cans. If you can’t find fire-roasted diced tomatoes, regular will do. Canned light coconut milk. I prefer light coconut milk in most of my soup recipes. I find full-fat to be just a bit too heavy and coconutty. You’ll need 1 can of light coconut milk. Veggies. I used carrot, celery, garlic and onion. A simple combo that works beautifully with the curry and lentils. I’d suggest chopping the carrot in large sized chunks for delicious tender bites throughout the soup. Vegetable stock. I used bouillon base to create the broth for this soup and I almost always do. It lasts forever in the pantry so you’re always ready to make yummy soups and you don’t have to worry about leftover stock going bad in the fridge. It’s ready in under 30 minutes in one pot. It’s virtually fat-free and provides plenty of protein and fibre. It’s full of cozy curry flavour. It’s perfect for food prep. It’s inexpensive and makes 6 hearty servings. It can be frozen for up to 3 months or refrigerated for up to 5 days. It’s a great pantry recipe. 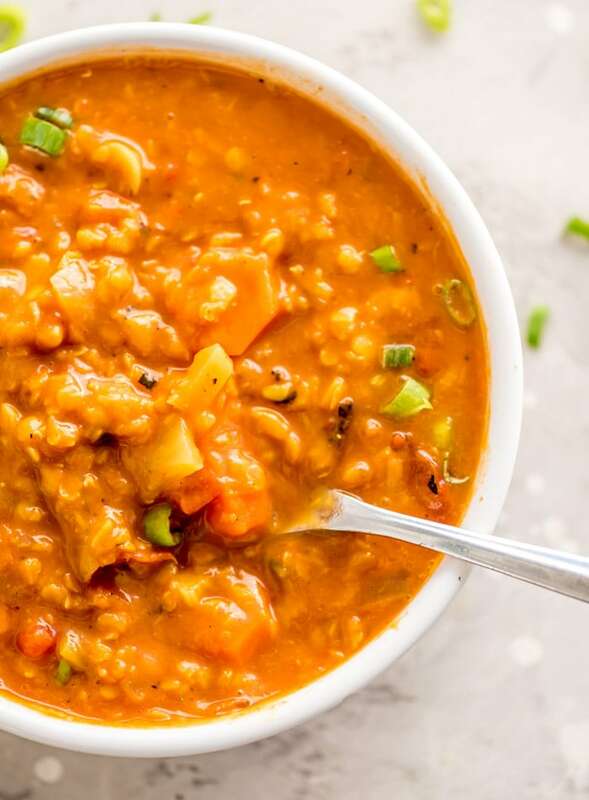 If you have canned coconut milk, red lentils and diced tomatoes, spices and stock on hand, you just need the veggies and you’re all set! A cozy, curried soup that can be on the table in under 30 minutes. Chop a view veggies, throw everything in a pot, simmer until the lentils are tender and you’re done! This soup will thicken up considerably in the fridge. Enjoy it the next day as a stew or add a little broth or water to thin it back out. Add the carrots, celery, onion and garlic to a soup pot with a splash of water. Cook over medium heat, stirring often, for 5-6 minutes. Add more water if it starts to dry out. Add the spices and stir to combine. Cook for another minute or two, adding a splash more water if needed. Add the lentils, diced tomatoes, coconut milk and stock. Simmer for 20-25 minutes until the lentils are soft and almost mushy. Stir in the coconut sugar and soy sauce (or gluten-free tamari). Serve right away or let cool and store in the fridge for up to 5 days or freezer for up to 3 months. This soup was a unanimous hit in our house and it will definitely become one of our “regulars”. The little bit of sweet with the kick of the spices come together for a beautiful flavor. Next time I will bring the liquid to a light boil before cutting it back to a simmer for the 20 min. I didn’t have any coriander so I added a little extra cumin and the flavor was still so good. Thanks for sharing the recipe! Oh, awesome. So glad you all enjoyed it!! I love this one too, the flavour is wonderful. Just made this tonight and it is soooo delicious! Husband had to come back in the room from where he was working and exclaim how good it was and 3 year old and 9 month old approved too. Great to know that it has all the nutrients from the lentils too. Definitely will be making it again! Haha, that’s awesome. So glad you guys enjoyed it!! Thanks for letting me know! I made this yesterday and it is so delicious! Thanks for the recipe. Thanks for trying it! So happy to hear you enjoyed it. Oh, that’s so awesome! I’m so glad you enjoyed it. 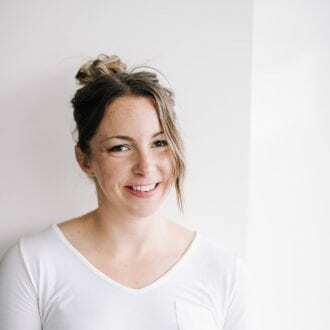 Good for you for trying something new! Excellent flavor – I like it so much I’ve made it 3 times already. Goes great as a lunch with 1/2 grilled cheese sandwich. Yum!!!! That’s wonderful! So glad you’ve been enjoying it!